Are you concerned that your students may have learning gaps in Math? Identify and close learning gaps in Math with one simple tool! 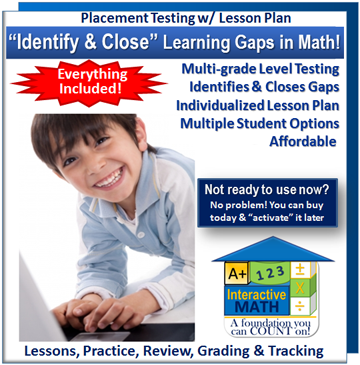 Our all NEW "Adaptive Placement Test and Individualized Lesson Plan" is designed to help you identify and close learning gaps in as little as just 3-months or less. It administers a series of "mini tests" to identify learning gaps for all major math concepts. It then creates an "individualized" lesson plan that includes everything you need to close the learning gaps! Colorful, engaging and fun multi-media lessons that teach math concepts using audio, visuals and text. Interactive Review for each lesson identifies and closes learning gaps by automatically re-teaching math concept if student provides an incorrect answer to any questions. Worksheets to apply math concept and practice problem solving with automatic grading and tracking. Various reports to measure student progress.